We're going to Dallas so you won't have to! The 2011-2012 season of the International Motorcycle Shows has kicked off and they're once again making a stop in Dallas. Since this is the closest venue to Oklahoma on the tour we're planning to head down and get the goods on all the new bikes, gear and industry news we can soak up in three days. Exhibitors include Harley-Davidson, Suzuki, Honda, Kawasaki, Royal Enfield, Yamaha, Triumph and dozens of the biggest names in the accessory and performance aftermarket. So we're heading south to bring you all the nitty gritty from the exhibit floor! Each year manufacturers show off their newest hardware at these shows. The latest models, new technology, seminars, test rides, stunt shows and the Marketplace offering special prices on riding gear is all packed into three big days. And we'll be live blogging from the Dallas Convention Center as it all happens! 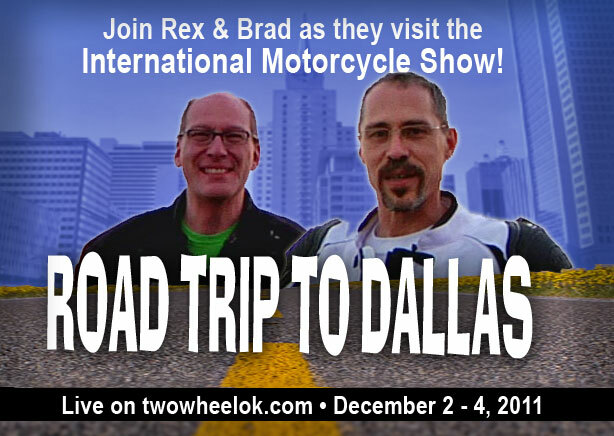 So make plans to visit www.twowheelok.com on December 2nd, 3rd and 4th for live coverage from the Dallas Convention Center and our Road Trip to Dallas!